GPS is the first Global Navigation Satellite System (GNSS), which provides very accurate positioning and velocity information everywhere on the planet. 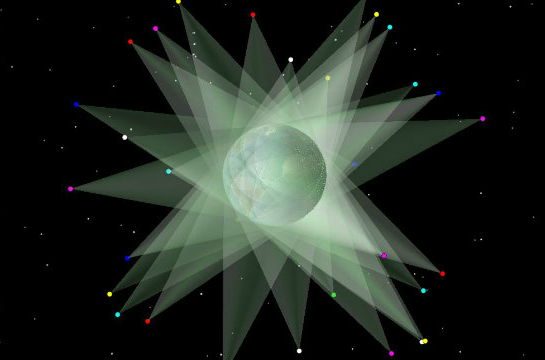 By sending timed signals toward the Earth from over 30 satellites in space, a receiver you own can determine your location to within a few meters. With additional aiding, reference signals, or data processing, locations can be determined within centimeters. Each GNSS satellite transmits a navigation signal. That signal is essentially a measuring stick, allowing your GPS receiver to measure the distance to that satellite. When you track at least four GNSS satellites, your receiver has enough information to determine your location and speed using common navigation algorithms. Interestingly, GPS is the first system to require the use of both relativistic and quantum physics; encompassing the realms of the very big and the very small. Relativity plays a role because the navigation signals used are transmitted from space, quite a distance from the Earth. Relativity predicts that these signals must be adjusted slightly to account for the lower gravitational potential there. Quantum mechanics comes into play to help keep the on-board atomic clocks precise to within a few nanoseconds. Without both of these effects accounted for, GNSS accuracy would be much worse. Because a GPS receiver can determine your location, it's popular to think that GPS also reports your position to the GPS satellites themselves or to others somewhere else. GPS is designed as a passive navigation system; meaning you can determine your position without any identifying information given away about your position. This makes sense because it was designed by the US military for use in battle. Having your position broadcast to others is not in a soldier's best interest. Other applications using the GPS chip in your phone or other gadget may do exactly those things, but GPS does not.